Decimal to Binary, Hex & Octal Converter to perform decimal to binary, decimal to hex & decimal to octal conversion online by using simple successive division methods along with step by step calculation & solved example problems. Decimal conversions can be done by either successive division method or successive multiplication method. The example problems have been accomplished by using successive division method to find the equivalent numbers in binary, hex & octal number systems. The below solved example along with step by step calculation for decimal to binary conversion let the users to understand how to perform such conversion manually. step 1: For decimal to binary conversion by successive division, divide the decimal number by 2 until the quotient reach to 1 or 0.
step 2: Note down every remainder (normally 1 or 0) for each successive division by 2. The first & last remainder is the LSD (least significant digit or bit) & MSD (most significant digit or bit) respectively. 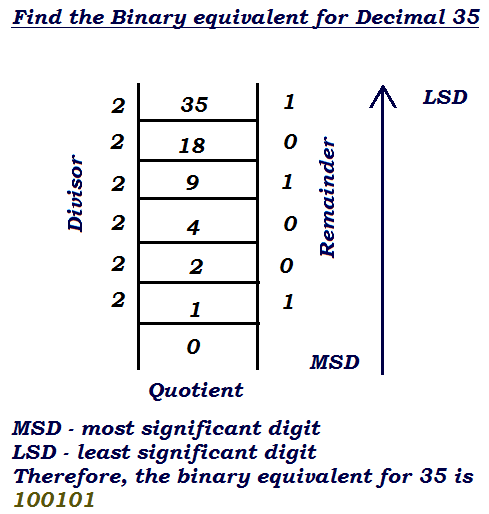 step 3: Arranging the remainder from MSD to LSD is the equivalent binary for the given decimal. The below solved example along with step by step calculation for decimal to hexa-decimal conversion let the users to understand how to perform such conversions manually. step 1: For decimal to hex conversion by successive division, divide the decimal number by 16 until the quotient reach to 0 or less than 16.
step 2: Note down every remainder (normally decimal numbers less than or equals to 15) for each successive division by 16. The first & last remainder is the LSD (least significant digit or bit) & MSD (most significant digit or bit) respectively. 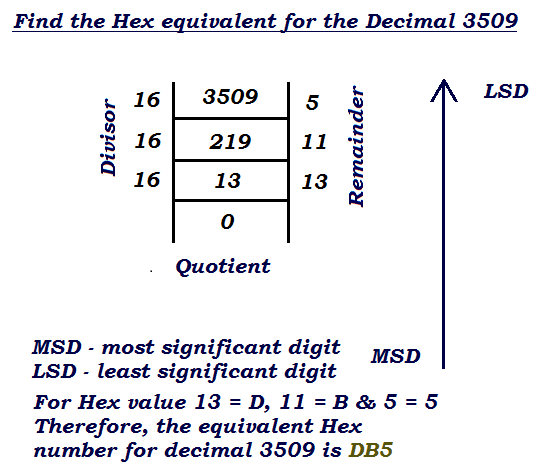 step 3: Arranging the remainder from MSD to LSD is the equivalent hex number for the given decimal. The below solved example along with step by step calculation for decimal to octal conversion let the users to understand how to perform such conversions manually. step 1: For decimal to octal conversion by successive division, divide the decimal number by 8 until the quotient reach to 0 or less than 8.
step 2: Note down every remainder (normally decimal numbers less than or equals to 7) for each successive division by 8 (normally decimal numbers less than or equals to 7). The first & last remainder is the LSD (least significant digit or bit) & MSD (most significant digit or bit) respectively. 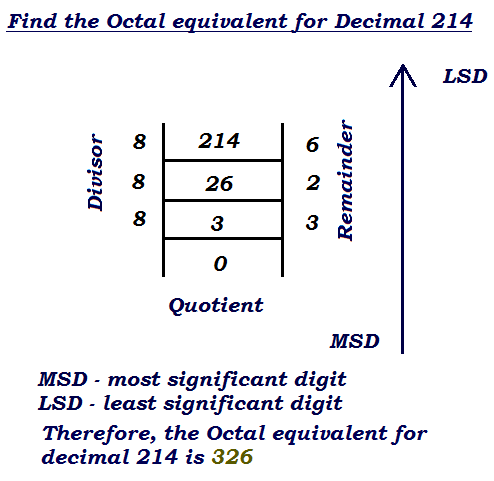 step 3: Arranging the remainder from MSD to LSD is the equivalent octal number for the given decimal. The number conversion is being used in various general & digital applications, therefore, sometimes it's important to perform the conversion between different digital number systems. The step by step calculation & solved examples may useful for users to understand how the values are being used in the examples, however, when it comes to online for quick calculations, this Decimal to Binary, Hex & Octal Converter helps the user to perform & verify such calculations as quick & easy as possible.